So after all the intense action of the first ten days of Tishrei, you’d think God would give us a nice break for the rest of the month. The night after Yom Kippur, the banging of hammers and clinking of metal rods begins to sound throughout the Jewish neighborhoods. We put those kids to work this year! And very soon, strange little booths begin to pop up in yards and on balconies. Some with metal frames and walls of cloth; some made of wood; some covered in palm branches, some in bamboo mats. 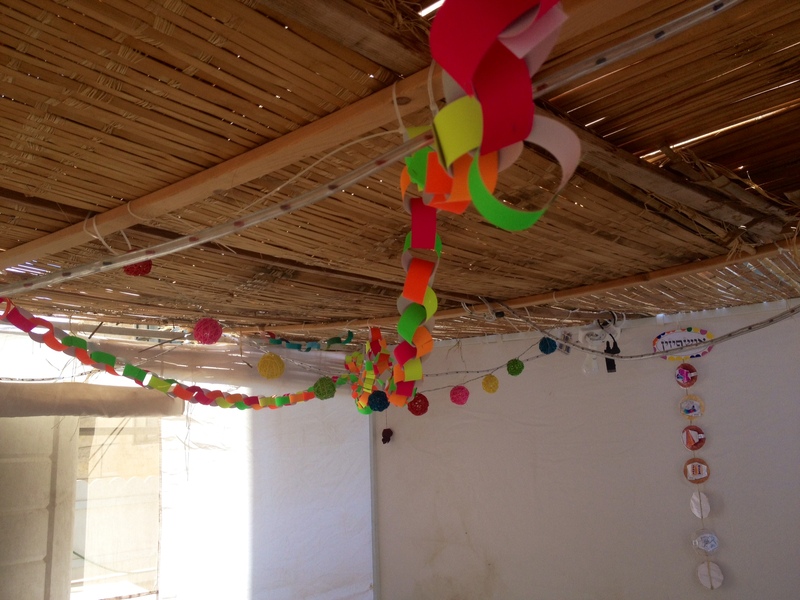 The children bring home a pile of paper chains, mobiles and other decorations from school. It’ll be even prettier at night when we turn on the lights. And this morning we woke up, all partied out from Shabbat (and Yom Kippur, Shabbat, and the two days of Rosh Hashana in the past two weeks…), to face yet. another. Jewish. holiday. Succot is one of the lesser-known, yet nonetheless important Jewish holidays. 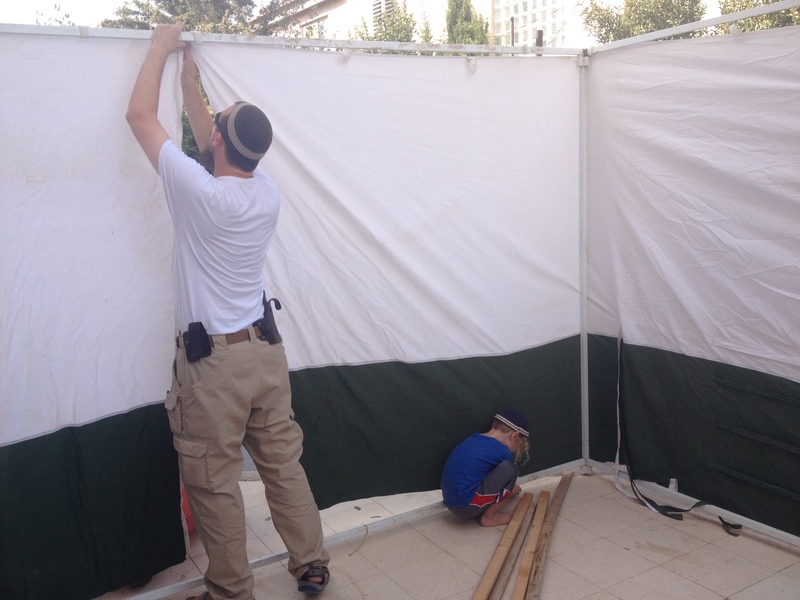 “Succot” means “booths,” and the holiday is called that because the main commandment of the holiday is to build an impermanent structure–a succah–outside our homes, and basically live in it for seven days. …Okay, what on earth is this about? I mean, we’ve got the other two regalim, Passover and Shavuot, and each one commemorates a very important event in the forming of the Jewish nation. 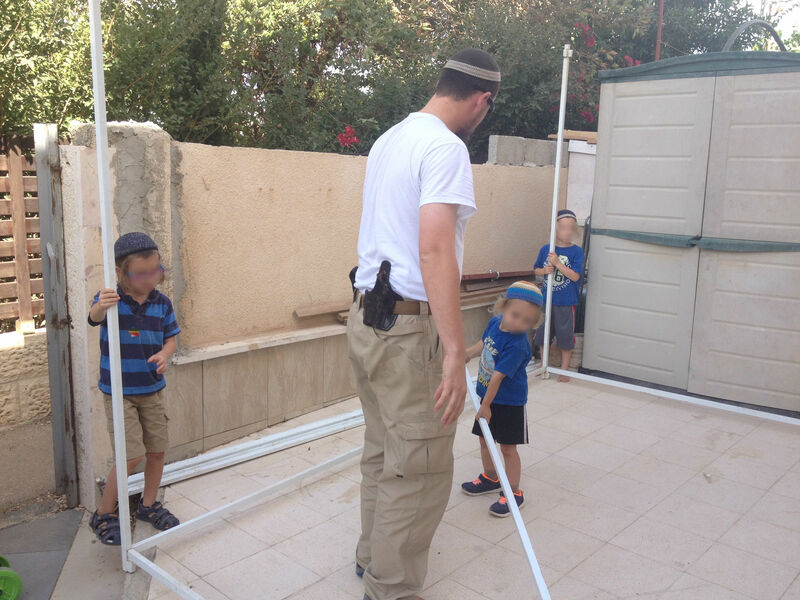 What happened on the 15th of Tishrei that involved moving out of our homes into a “booth”? Well, nothing actually happened on the 15th of Tishrei. But while Passover commemorates the Exodus, and Shavuot commemorates the giving of the Torah, Succot commemorates something else, something less momentous, and more subtle, but nonetheless crucial to our daily lives. The succot represent the Clouds of Glory that surrounded the Israelites as they walked through the desert from Egypt to the Promised Land. In the text of the Torah it says that the Israelites were led through the desert by a pillar of cloud during the day and a pillar of fire during the night. The Sages teach us that they were actually surrounded by this protective cloud on all sides–above, to protect from the brutal desert sun; below, to protect them from scorpions and snakes; and on all sides, to protect them from bandits and wild animals. So what makes me say that is this so relevant to our daily lives? Because this holiday is really about understanding that like fish who can’t see the water in which they swim, we are constantly immersed in God’s presence. After a month and a half of introspection, breaking down the barriers between us and God and between ourselves and who we want to be, the time has come to simply bask in God’s glory and remind ourselves that He is always with us. So for seven days, we move out of the comfort and security of our permanent homes, into these little impermanent structures. While they represent the Clouds of Glory protecting us, they also represent the impermanence of this physical world. And in the typical style of Judaism, we focus our attention and our lives on our existence within that world, celebrating all the goodness God has given us within it. 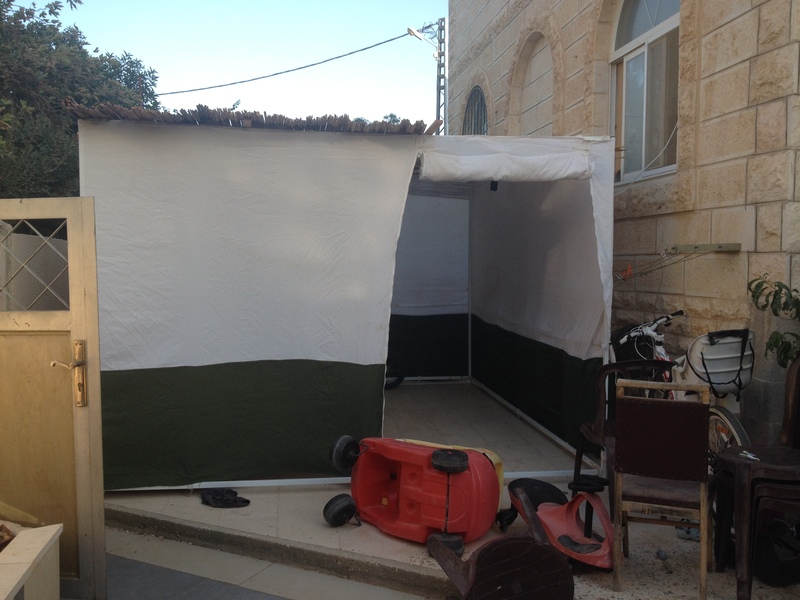 As usual in Jewish law, there are strict specifications for what qualifies as a succah. It must have at least two and a half walls that are at least 80 cm high and do not move around too much in the wind. The interior must measure at least 56cmx56cm. Its roof must be made out of organic material–branches or leaves, that are disconnected from their source, and parts of the succah that are covered by a permanent roof or a living tree do not qualify. The branches or leaves must be sparse enough so that the rain can come through and the stars are visible through them. The idea is that though it is impermanent, and insecure, and at the mercy of the elements, we fear no evil, for God is with us. Succot begins with a Yom Tov (or two outside Israel, as explained here). Then follow six days of chol hamo’ed, “the mundane of the holiday,” in which we are not restricted from all the acts of creation like on Shabbat and Yom Tov, but are supposed to refrain from working as much as we can. During these seven (or eight) days, we must eat all our meals in the succah, and sleep in it if possible. It is highly encouraged–as always–to host guests in one’s succah, and there is a Kabbalistic concept that a special spiritual “guest” comes to “visit” us for each day of the holiday: Abraham the first day, Isaac the second, then Jacob, Joseph, Moses, Aaron, and finally David. We call them “ushpizin” (Aramaic for “guests”), and recite a special passage “inviting” them in (or, more accurately, the spiritual attribute each of them represent–which correspond to the Kabbalistic spheres as I explained in the entry on counting the Omer). When I was collecting ideas for “weird things Jews do,” this one came up a lot, but I left it out of that list because it’s not just a weird habit or tradition–it’s an actual mitzvah, a Torah commandment. So what are the four species? That cluster of three types of branches is called a lulav. 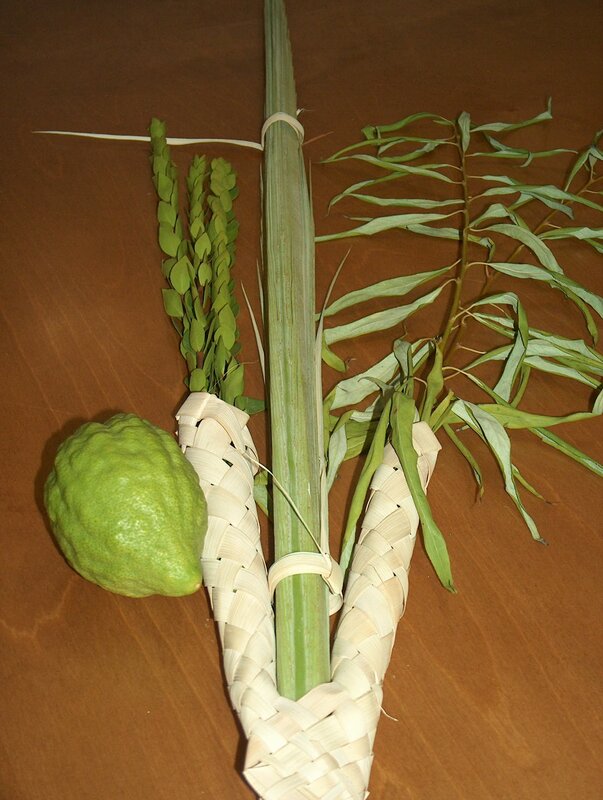 It is composed of a date palm frond in the center (also called a lulav), three myrtle branches on the right (hadassim), and two willow branches (aravot) on the left. The etrog is a citron (el poncem for you), a lemon-like citrus fruit with a thick rind. Together, they comprise the arba minim, the four species. So, um… what do we do with them? While we pray during the holiday, we hold them together, and at specified points in the prayers, shake them in all directions–the lulav in the right hand, and the etrog in the left, opposite the heart. The idea is, again, to remind us of God’s presence all around us. Now, for anybody (with the possible exception of a religious Christian! ), this makes for a pretty bizarre-looking scene: a bunch of guys parading around the synagogue holding a clump of plants and chanting. Look, no one ever said we had to be normal. So what’s the symbolism here? Why these plants? The two most common explanations are as follows: one states that plants symbolize the different parts of the body. The etrog represents the heart; the lulav, the spine; the myrtle, the eyes, and the willow, the mouth (each because of the shape of their leaves). The idea is that we are subjugating all these parts of our bodies–our hearts and minds, our limbs, our eyes and power of sight, and our mouths and power of speech to service of God. The other explanation is that the plants symbolize four different kinds of Jews. The etrog, which has a fragrance and a flavor, represents a Jew who studies Torah and performs good deeds. The date palm, which has a flavor but no fragrance, represents one who performs good deeds but does not study Torah. The myrtle, which has a fragrance but no flavor, represents the opposite; and the willow, which has no fragrance and no flavor, represents a Jew who does neither. We are to strive to be like the etrog. So the four species symbolize the different components of who we are–as individuals and as a community. And the idea of holding and shaking them during the prayers is that during this particular celebration of God’s presence, we are coming together and devoting everything we are to the continuous pursuit of His closeness. We seek Him in our diverse community, in our words, in our deeds, in our thoughts, and in our hearts. So you’d think that after the intense first ten days of the month of Tishrei and the seven or eight days of Succot, then we would finally get a break! But because there is no specific commandment associated with Shmini Atzeret, the Sages decided to designate it as the holiday to celebrate renewing the cycle of the weekly Torah portions. You see, the Torah (as in the first five books of the Bible) is divided into portions, and a different one is read each week. It takes a year to get through all the portions, and Shmini Atzeret is when we read the last portion and celebrate the completion of the Torah readings. For that reason, it is also called Simḥat Torah, “rejoicing in the Torah”. I should point out that they are only on the same day in Israel. Outside of Israel, because of the need for two days of Yom Tov (which I explain about here), they are split. The first day is Shmini Atzeret, and the second day, Simḥat Torah. So what does celebrating the completion of the Torah readings involve? A whole lot of dancing and singing! The congregation takes out all the Torah scrolls and dances with them, shoving all the chairs and benches in the synagogue to the side. This part of the services can last for hours on Simḥat Torah, and it occurs both during the evening services and the morning services. Parents involve the children by dancing with them (fathers often put their kids on their shoulders), and candy is frequently distributed. 1. 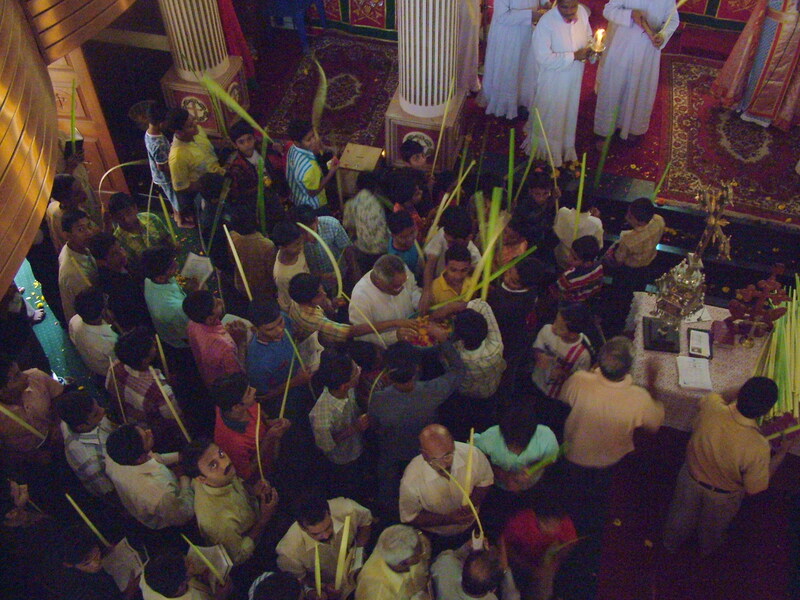 For the Jews, Muslims or otherwise uninformed among you: Palm Sunday is the Sunday before Easter, and in many traditions, it is celebrated by holding a procession of the congregants carrying palm fronds, in commemoration of Jesus’s triumphal entry into Jerusalem before the crucifixion. “Palm sunday” by english wikipedia. Licensed under CC BY-SA 3.0 via Commons.